The ‘237 patent describes an entertainment system whereby a player can manually control the actions of his animated character with the push of a button. During gameplay, situations arise which require the player to act in response. When the user reacts to a specific scene, if the timing of the action is correct, the character will react in a certain way. If the time is not correct, however, the action sequence will be different. 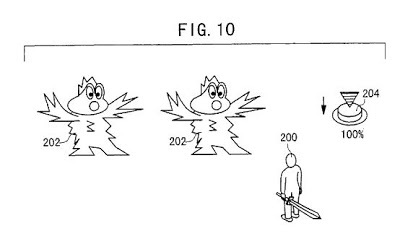 This patent has arisen in role-playing games mostly. An example that used it was Diablo. An entertainment system comprises parameter changing means for permitting a user to input manipulation data by successively pressing a decision button when a button icon is displayed on a display monitor. Based on the manipulation data, the parameter changing means changes damage of a virtual enemy (e.g., monster). The parameter changing means comprises button icon displaying means for displaying the button icon on the display monitor for a predetermined period of time, accumulating means for counting the number of times the decision button is pressed for inputting manipulation data when the button icon is displayed on the display monitor, and damage calculating means for changing damage of the monster based on the counted number of times. 1. An entertainment system comprising: an entertainment apparatus for executing various programs; at least one manual controller for inputting a manual control request of a user to said entertainment apparatus; a display monitor for displaying an image outputted from said entertainment apparatus; and parameter changing means for permitting the user to input manipulation data by specific manipulation of said manual controller when a symbol indicating permission to input the manipulation data by said specific manipulation is displayed on said display monitor in a scene of a game, and for changing a predetermined parameter of a program presently executed by said entertainment apparatus based on the manipulation data inputted by said specific manipulation.